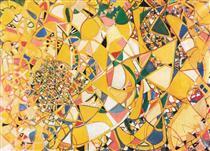 Fahrelnissa Zeid (Arabic: الأميرة فخر النساء زيد‎) Fakhr un-nisa or Fahr-El-Nissa (7 January 1901–5 September 1991) was a Turkish artist best known for her large-scale abstract paintings with kaleidoscopic patterns. 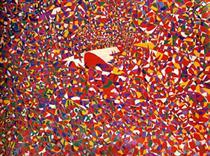 Also using drawings, lithographs, and sculptures, her work blended elements of Islamic and Byzantine art with abstraction and other influences from the West. 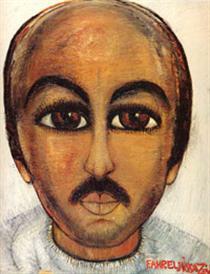 Zeid was one of the first women to go to art school in Istanbul. 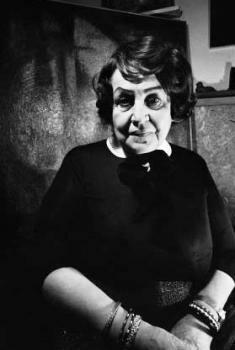 She lived in different cities and became part of the avant-garde scenes in Istanbul, pre-war Berlin and post-war Paris. 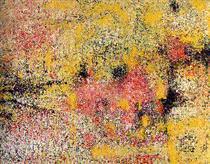 Her work has been exhibited at various institutions in Paris, New York, and London, including the Institute of Contemporary Art in 1954. 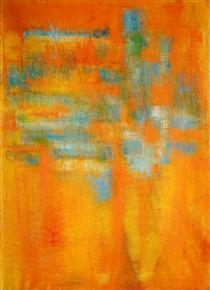 In the 1970s, she moved to Amman, Jordan, where she initiated an art school. In 2017, Tate Modern in London organized a major retrospective of the artist and called her "one of the greatest female artists of the 20th century." In the 1930s, she married into the Hashemite royal family of Iraq, and was the mother of Prince Ra'ad bin Zeid and the grandmother of Prince Zeid bin Ra'ad. Fahrelnissa Zeid was born Fahrünissa Şakir (hereafter referred to as Zeid), into an elite Ottoman family on the island of Büyükada. Her uncle, Cevat Çobanlı Pasha served as the Grand vizier of the Ottoman Empire from 1891 to 1895. Zeid’s father Şakir Pasha was appointed ambassador to Greece, where he met Zeid’s mother Sara İsmet Hanım. In 1913, Zeid’s father was fatally shot and her brother, also named Cevat, was tried and convicted of his murder. 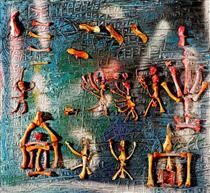 Zeid began drawing and painting at a young age. 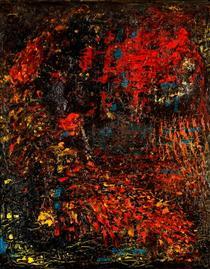 Her earliest known surviving work is a portrait of her grandmother, painted when she was 14. 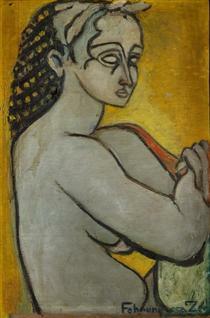 In 1919, Zeid enrolled at the Academy of Fine Arts for Women, in Istanbul. In 1920 at the age of nineteen, Zeid married the novelist İzzet Melih Devrim. For their honeymoon, Devrim took Zeid to Venice where she was exposed to European painting traditions for the first time. They had three children together. Her eldest son, Faruk (born 1921), died of scarlet fever in 1924. Her son Nejad (born 1923) went on to become a painter, and her daughter Şirin Devrim (born 1926) became an actress. Zeid travelled to Paris in 1928 and enrolled at the Académie Ranson, where she studied under the painter Roger Bissière. 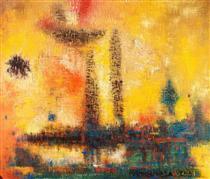 Upon her return to Istanbul in 1929, Zeid enrolled at the Istanbul Academy of Fine Arts. 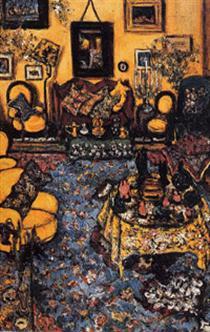 Her brother Cevat Şakir Kabaağaçlı was a novelist and her sister Aliye Berger was a painter. Zeid divorced Devrim in 1934, and married Prince Zeid bin Hussein of Iraq, who was appointed the first Ambassador of the Kingdom of Iraq to Germany in 1935. The couple moved to Berlin where Zeid hosted many social events in her role as an ambassador’s wife. After the annexation of Austria in March 1938, Prince Zeid and his family were recalled to Iraq, taking up residence in Baghdad. Zeid became depressed in Baghdad and on the advice of a Viennese doctor returned to Paris after a short time. 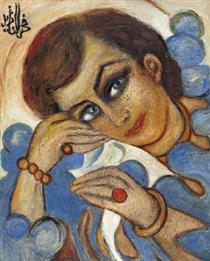 She spent the next years of her life traveling between Paris, Budapest, and Istanbul, attempting to immerse herself in painting and recover. 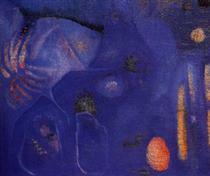 By 1941, she was back in Istanbul and focusing on her painting. Karma bir doğurganlık Princess Fahrelnissa Zeid ? 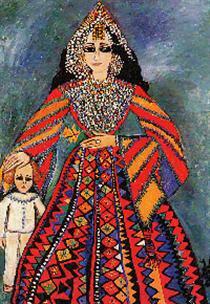 Lady in Blue Princess Fahrelnissa Zeid ? 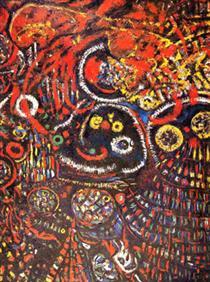 Composition with bones Princess Fahrelnissa Zeid ? London Princess Fahrelnissa Zeid ?